The latest in our best selling Encyclopedia of Art series now focuses on a popular topic for both writers and illustrators: how to make, craft, and sell children’s books. This practical book is a step-by-step guide to becoming a successful graphic storyteller, showing how to create exciting plots and engaging characters that will delight young readers. Topics feature a wide range of genres, from fantasy and fairy tales to action-packed adventure, and offers guidance on how to tailor work to suit different age groups. 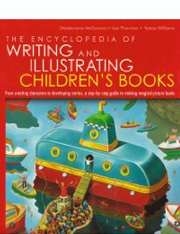 The Encyclopedia of Writing and Illustrating Children’s Books also features a special section on the commercial realities of the children’s publishing industry, with tips on presenting and promoting work, and includes a gallery of inspirational examples from renowned children’s writers and illustrators.